When it comes to your bridal gown fittings, what should you expect to happen? Your dress will be pinned to fit you where it is a little too big or too long. If it needs letting out, it will be measured for that. You will be given an estimate of the cost for alterations on your wedding dress, for which a deposit will be due. At that time you will be given an appointment to come back to pick up the dress. That's the short of it! Before you make an appointment make sure you don't have this problem with water retention. Read about how water retention can be a big problem when it comes to your wedding gown alterations. In order for you to end up with good results, you need to to know what you need to bring to your wedding dress fittings. Here is a list of what you need. You need the bra you will wear under your dress. This way you can be sure it will fit the same on your wedding day the same way it did at your fittings. A strapless bra will fit differently than a bra with straps. And one brand of strapless bra will fit differently than another brand. Not having the bra you will wear with the gown at your bridal dress fittings can cause your gown to be fitted incorrectly. Don't forget your petticoat bridal slip. If you plan to wear a bridal crinoline slip, you must have it at your bridal dress fitting. The slip will lift your dress off of the floor, so if you don't have it for your dress fittings, your hem could be adjusted to a length that will be too short once you add the slip. You need to have the shoes you plan to wear with your gown. Your hem cannot be fitted properly without the shoes you plan to wear. Some will ask to be fitted with a pair of shoes about the heel height they plan to buy. This is a risk you take, because what if you pick up a lower or higher heel than you had planned? Once your dress is cut off and hemmed there is no going back. You must bring any body shaping garment you plan to wear under your dress. Body shapewear can reshape you or pull you in 1 size or 2. I have seen cases where once the right bra and shapewear were put on, some found that their fitting problems disappeared. So make sure you bring these to try on with your gown. Again.... make sure you have everything you plan to wear under your gown for each of your bridal gown fittings. This is the key to having your gown fit you perfectly! What Happens At Bridal Gown Fittings? The finished product at pick up. What should you expect to happen at your gown fitting? You will be asked what you feel need to be done to the gown. Then you will be fitted working from the top down. Your shoulder area will be done first. Then your neckline will follow. If you decide to have bra cups inserted, these will be pinned in before the side seams are taken in. Then the side seams, zipper or darts, if needed, are adjusted. 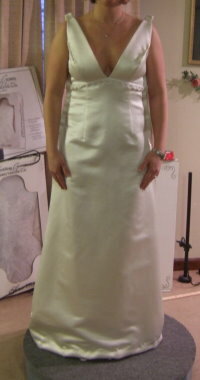 The hem is pinned up to the correct length and then the bustle is pinned. In fitting a strapless wedding gown... sometimes after the hem and bustle are done your body may adjust to the original pinning of the side seams of the dress and start to feel loose. At this time your gown will be pinned tighter. If this happens at your fitting remember... when you first put the gown on after the alterations are done, expect that it will feel very tight. But remember your body will shrink down and at some point the gown will not feel as tight. After the original bridal gown fitting... you may need to come back for an additional fitting before the final try on and pickup. Most of the time you will come in for the first bridal gown fitting and then come back for the final try on at the pick up date. Just make sure to bring the same undergarments and shoes you brought for the first fitting of your wedding dress. On the day you pick up... you will try on your gown to make sure you that everything is to your liking. This way you will know before you take home your gown what if will look like on your wedding day. After you approve the work done you can take your bridal gown home that day. What if something is wrong? Sometimes after all the alterations are done and you try on your gown on the pick up day, something may need to be re-adjusted. Sometimes there are adjustments that pop up that don't become apparent until everything is done. This sometimes happen when there are a lot of different areas on the dress that need altered or there is a resizing issue, which also involve major alterations. Usually it turns out to be something small that can be easily fixed. Sometimes your gown can be adjusted on the spot and after trying it on again, to make sure the adjustment worked, you can take your gown home! 1. What if I forget to bring part of the undergarments or forget my shoes, can I be fitted? Unfortunately no, I would not be able to fit you. You would have to reschedule your fitting. 2. I expect my weight to change because I am losing weight. When should I begin my bridal gown fittings? You can start them when you like. But if you are trying to avoid having the work done and then having to pay again to have it re-done because you lost more weight... then you should start your fittings when you go on maintenance. Once you do that your gown fittings can begin. 3. Do I have to pay for extra fittings if needed? Most cases no you will not have a charge when I feel the dress fitting is necessary. The only time you may have to pay for a fitting is if you ask me if you can come back to try on the dress just to show someone your dress. If there is someone special you want to see you in your gown, have them come during your scheduled bridal gown fitting. How many can I bring to my bridal gown fittings? Because I have limited seating space in my home and limited parking in front of my home, I can accommodate up to 2 additional people. More than that can start to become a little crowded, especially if children are brought along also. Just a suggestion... it is best to only bring 1 person for your fitting. Make sure it is someone whose opinion you highly value and who you feel will be respectful of your feelings. This way you are not dealing with varying opinions which cause confusion, frustration and doubts. Think about the fitting fiascos seen on the TV reality bridal shows. I don't want that to happen to you! About bringing your fiance to your bridal gown fittings... If you want your fiance to come with you he is more than welcome to accompany you. However. because I don't have a waiting area, he will see you in your gown if he comes inside. So if you don't want him to see you in your gown, you will need to make him aware that he will need to wait for you outside. 5. Is it alright to bring children to my bridal gown fittings? I don't mind children coming, but from past experience, brides have a better experience not bringing along any children. I know sometimes it is not convenient to find a daycare provider. I only want to caution you that again seating is limited and space. And depending on the age of the child, they may have to accompany you in the room you will be changing in. So please weigh carefully whether your child could be a distraction for you. So far I have been leaving this to the judgment of each parent. 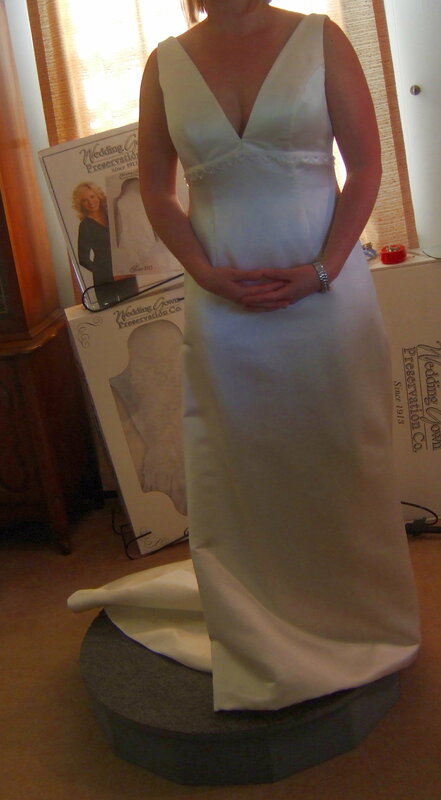 I want you to get the most from your fitting and have a stress free experience. 6. If something needs to be adjusted at the pick up bridal gown fitting, will I be charged additional charges for the work? It depends on why your dress has to be adjusted. If it is due to something on my part, then there will be no additional charges. It goes without saying that if additional work is needed that was not foreseen before, there will be an additional charge for this. But if you decide to change your bra or other underpinnings and the dress now fits differently at your pick up fitting, then you will have to pay to have the work done over. If you change your shoes and the dress hem needs to be adjusted for the new shoes, then you will be charged for this. If you gain or lose weight and need your gown adjusted again you will have to pay for this. 7. What happens if something comes up and I need to pick up my dress after the inital fitting but before you start the work? If your wedding is called off, is postponed or you need it back for some other reason... call me as soon as possible! If I have not started your wedding dress alterations you can pick up you dress and get a refund of your deposit, minus a fitting fee of $30. If I have started the work on the gown you will have to pay for the work completed at that time. The amount for the work will be deducted from the deposit and a refund for the balance will be given. If the work completed is more than the deposit, you will have to pay any balance due in order to pick up your gown. I hope I have answered any questions you had about what to bring to your bridal gown fittings and why it necessary to have certain items. Your wedding gown will turn out to fit picture perfect if you comply with these requirements!.